Norm N. Nite (born Norman Durma, January 25, 1941), is the author of the Rock On: The Illustrated Encyclopedia of Rock N' Roll book series. Nite began his career as a DJ at WGAR (AM) in Cleveland and later at WMJI there. 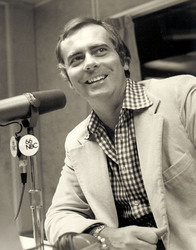 Later he would host shows at WCBS-FM and WNBC in New York City. His historical interest in Rock & Roll led him to compile, as the first volume of "Rock On" describes it, "an exhaustive array of data on more than 1,000 of the most popular artists of the fifties and early sixties. Any singer who had a top 100 single during the golden days of rock n' roll can be found in (the) book." Subsequently, due to the popularity of this volume, first released in 1974, he authored a second volume in 1978, covering, as described on the dust jacket, "The Modern Years: 1964-Present" with an introduction by Wolfman Jack. In 1985 Rock On Volume 3 was released and billed "Rock On Volume 3 – The Video Revolution: 1978 – Present". During 1988 he narrated the radio program, Solid Gold Scrapbook. In July 2005 Nite began broadcasting live from the Rock and Roll Hall of Fame in Cleveland on SIRIUS Satellite Radio Channel 5 (SIRIUS Gold, now known as Sirius XM 50s on 5), which is also available on channel 9905 on the Dish Network. His show had originally aired Wednesdays through Sundays, but in August 2006, he cut back his on-air schedule to every Friday through Sunday afternoons from 3-6 p.m. US Eastern time (12-3 p.m. Pacific time). Although he once split his time between New York City, New York and Cleveland,Ohio- he now lives in Cleveland full-time.